JCE 2.0 introduces a number of new widgets to make it easier to set certain parameters. These include Editable Select Lists, a Colour Picker and a File Extension Editor. The Editable Select List (sometimes referred to as a ComboBox) allows you to select a value from a list of options and add or edit the value. To select a predefined option, click the arrow on the right of the field as with a normal select list and select the desired value. To add a new value or edit a selected value, click the edit icon next to the select list. The select list will be replaced by an input field for you to type in the new value. 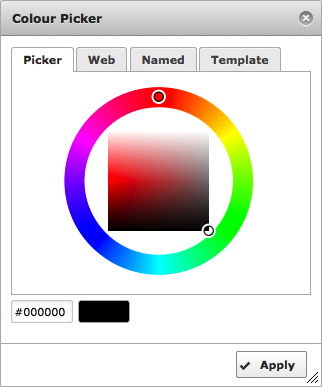 Clicking the colour picker icon will open the Colour Picker dialog where an infinite number of colours can be selected. The outer circle determines the hue and the inner square the lightness of the colour. Once the desired colour is found, clicking Apply close the colour picker and sets the colour parameter. The file extensions widget allows you to add new file types eg: xml or jpg, new file groups, eg: Images or Word, remove file types and file groups and move file types between groups by drag & drop.